TAKING a trip down memory lane Greenfield School is on a mission to locate former students in the hopes of returning some of their childhood artwork. 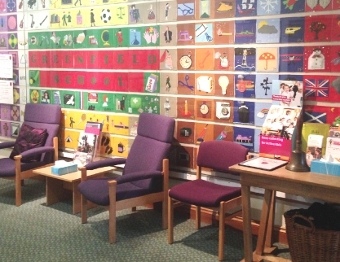 Over the years pupils at the Brooklyn Road school have created a felt square representing different fundamental aspects of classroom life – and for 15 years it has hung proudly in the main reception. However, due to recent damages the school has decided to take down the epic collage. Ex-pupils from the year 2000 are now being hunted down, as Greenfield is taking action to return each and every felt square to its rightful owner. Having had its glory days behind a big glass façade for all visitors, students, teachers and parents to admire, the banner will be officially taken down during the Easter holidays as plans for redecoration in the reception area are in the works at Greenfield. Determined to deliver the ageing masterpieces, the school is planning to set-up a page on its website, through which people can contact them on the subject. At the same time, Greenfield is going to use this opportunity to start up an alumni for past pupils. With the banner as an eye-opener – the reminder that time is racing by – Greenfield is planning lots of changes and developments. From the summer term the school will have 200 pupils on its books – the highest total since the Millennium – and the competition for places is as fierce as it has ever been. There are also plans to redevelop the art and design technology room into a modern and inspiring facility at the very top of the school. Greenfield School Admissions Registrar Alice Pepe said: “We are hoping to reach as many of the past pupils (who contributed to the banner) as we can; it would be a real shame to throw their beautiful work away. “With Greenfield going through such an exciting period of development and ever-increasing pupil numbers, we are also hopeful that past pupils will be interested in hearing what’s going on at their old school, and might want to share with us their positive memories of the school.